MCRS® Magnet for MCRS® Vest (*not for the collar of the vest !). All the MCRS® Magnet`s are isolated on the side towards your body, they only pull at the frontside where the ball or biteroll is sticked. 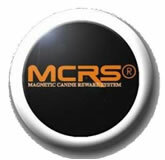 MCRS® Magnet(s), this to be able to place your ball on 7 different strategical places besides the collar of the vest. Can also be used for additional use on clothing and-or reviertents.